The Lambley riser recliner is a British made chair in a split back cushion design and featuring a full width 'chaise' seat cushion. 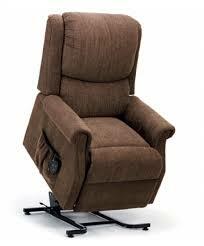 The Lambley rise recliner is available in three sizes, Petite, Standard or Large. The Lambley riser recliner is available in a number of fabric options and carries a full 5 year guarantee.